352 (5 April 1945), 353, 354, 355, 356, 357(A), 358, 359, 360, 361, 363, 364 (25 April 1945). (A) Non-Credited aborted mission (for mechanical reasons). For Mission dates, targets and Mission Reports, see Combat Missions. (P) For photo see Nose Art Photos. There are no photos of the (No name) B-17s. 2Lt Frank E. Welshon, Jr. (P) - First two missions (352, 353) flown as CoPilot with 2Lt Clarence D. Bristol as combat orientation Pilot. Other missions flown as First Pilot. Completed 11 credited combat missions. 2Lt James E. Sumpter (CP) - Flew on all of the 2Lt Welshon missions except two (352, 353) Two missions (352, 353) flown as CoPilot with the 2Lt Robert E. Edmunds crew. Completed 11 credited missions. 2Lt Truman Robinson (N) - Completed 7 credited missions with 2Lt Welshon (352, 353, 354, 355, 354, 363, 364).The 2Lt Welshon flew with four different substitute Navigators on five missions (357(A), 358, 359, 360, 361). 2Lt James O. Inman (B)(WIA) - Completed 6 credited missions with 2Lt Welshon (352, 353, 354, 360, 361, 364). The 2Lt Welshon crew flew with six substitute crewmen on six dispatched missions: One Bombardier (363); Five Enlisted Men Toggliers (355, 356, 357(A) ,358, 359). 2Lt Inman's shoulder was wounded by a flak hit on his last mission (364) and he was placed in the 303rd Station Hospital. Three other crewmen on three other crews were also wounded. These four men were the last 303rd BG(H) Wounded in Action crewmen. 2Lt Inman died of a stroke in his Myrtle Beach, SC home on 23 August 1977 and was buried in the Hillcrest Cemetery in Conway, SC (Per his Grandson Tim Sellers). Sgt James L. Jackson (E) - Completed 9 credited missions with 2Lt Welshon (352, 353, 354, 358, 359, 360, 361, 363, 364). The 2Lt Welshon crew flew with two different Engineers on three dispatched missions (355, 356, 357(A)). 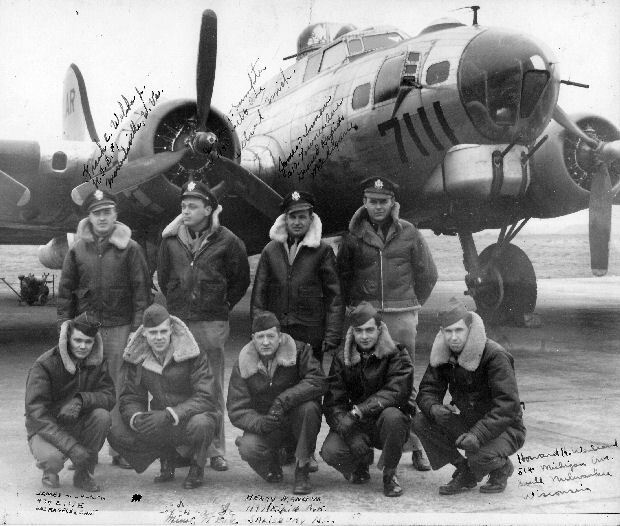 Sgt Maurice K. Selberg (R) - Completed 6 credited missions with 2Lt Welshon (357(A), 358, 359, 360, 361, 363, 364). The 2Lt Welshon crew flew with two different Radio Operators on five credited missions (352, 353, 354, 355, 356). Sgt Russell C. Paris (BTG) and Sgt Henry L. Mangum, Jr. (TG) - Completed all of the 12 dispatched (11 credited) missions of 2Lt Welshon. No substitute crewmen used. Sgt Howard H. Wentland (WG) - Completed 2 credited missions with 2Lt Welshon (354, 355) and one credited mission with the 2Lt Clarence D. Bristol Crew (353) - Total of three credited combat missions. The 2Lt Welshon crew flew without a Waist Gunner on ten dispatched missions (352, 353, 356, 357(A), 358, 359, 360, 361, 363, 364). Passengers - The 2Lt Welshon crew flew with three different Voice Interpreters (VI) on three dispatched missions (357(A), 359, 360).